So, today for Crossfit we had a doosey of a WOD as is the case for weekend WOD’s. It was called Olympic Bar Mile. It was brutal, brutal and I wasn’t sure I’d be able to finish it but I did. My weights were pretty light at about 35lbs and when I had to do the run I took the 10lb plates off each time and that really slowed me down. The last run I opted to grab a nearby dowel instead because I was extremely fatigued. My time was around 43 minutes and I didn’t even look to see what other peoples times were but I do know I was one of the last 4. I was just super proud to have survived it. I don’t usually use gatorade for Crossfit but today I was smart and grabbed some Nuun Tabs since it’s so hot out (32* and with the humidity feels like 35* for those of you coming to Vancouver for the Sea Wheeze) and that was good of me because I’ve been sweating buckets all day, especially during that workout and have had a bad headache. Anyways, I digress from the most important part of this post, what I wore. I got a chance to finally really work out my new Angel Blue Energy Bra (after wearing it casually since I got it). 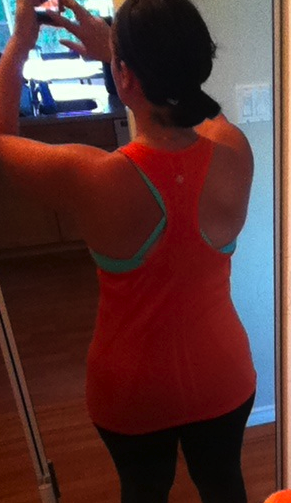 It was perfect and comfortable and super breathable for todays workout. I just love a nice luxtreme bra that doesn’t have the yucky mesh inner layer. I didn’t really need this bra but I’m really glad I got swayed into buying it, I justified it by returning the Run: Catch Me Tank. 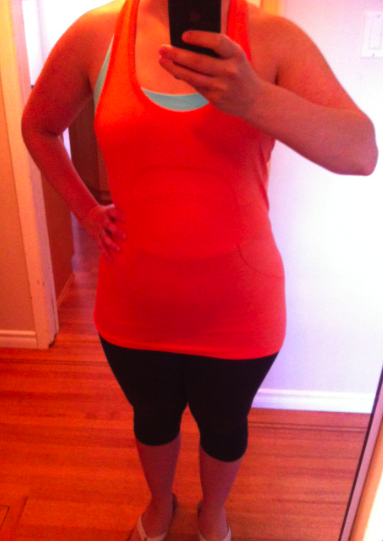 I had a black Energy Bra last year but I sized down in it for more support for longer runs. This time I got it TTS and it’s slightly less supportive but extremely comfortable. For reference, it’s more supportive than the Flow Y or Free to Be Bras but less supportive than my Ta Ta Tamer or Cross My Heart Bra. It’s been great for everything crossfit including running but not super for the double under portions of the warmups. I felt like I jiggled a little too enthusiastically during the skip rope (single unders for me). I wore it under my Dazzling Swiftly SL today and I think it was a truly inspired color combination if I do say so myself. I think Angel Blue just looks amazing with oranges, plum, currant, power purple and coal. I’m really looking forward to getting more items in that color since it’s rumored there will be more.